Scarlett Johansson and Robert Downey Jr.stars of "Avengers Assemble"
The 46-year-old actor - who will star alongside the blonde beauty in 'Avengers Assemble' - has grown attached to his cast mates while shooting the superhero film, and he sees Scarlett, who plays the Black Widow, as a sister figure having previously worked with her on 'Iron Man 2'. When asked what his opinions of his fellow Avengers are, he replied: "I feel like a big brother to Scarlett and Chris Hemsworth has the whole package. "Jeremy Renner is a serious actor who doesn't take himself seriously at all." 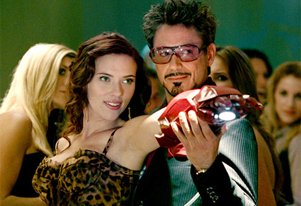 Robert is reprising his role of Tony Stark and his alter ego Iron Man - who he played in the 2008 movie of the same name and its 2010 sequel - in the forthcoming film, which is written and directed by Joss Whedon, but he had concerns about doing it without his 'Iron Man' helmer Jon Favreau. He added: "He's like a brother. You don't know whether you can't live without him or you want to strangle him in his sleep. I just love the guy." But the 'Tropic Thunder' star admits Joss was a "perfect" writer and director for the movie. He explained to Total Film magazine: "He was perfect. During a scene I could say, 'Is this right?' Ten minutes later he had three pages of options for me to try."